Desjardins customers can now use their Mastercard credit cards with Apple Pay, joining Visa and Interac debit cards. Apple Pay launched last October for Desjardins customers. iPhone in Canada reader Marc let us know a couple weeks ago he was able to add his Desjardins Mastercard to Apple Pay, but could not activate it. But as of today, he said the card was activated for Apple Pay successfully. 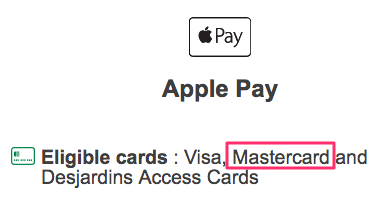 Desjardins also updated their website to note the addition of Mastercard support for Apple Pay. 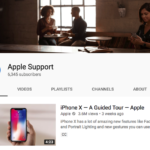 Apple has not updated their Apple Pay banks list to note Mastercard support for Desjardins, but that should happen soon. Let us know if you’re using your Desjardins Mastercard with Apple Pay.